Small area of forearm's skin in 10 female volunteers was exposed to RF-EMF (specific absorption rate SAR = 1.3 W/kg) and punch biopsies were collected from exposed and non-exposed areas of skin. Proteins extracted from biopsies were separated using 2-DE and protein expression changes were analyzed using PDQuest software. Analysis has identified 8 proteins that were statistically significantly affected (Anova and Wilcoxon tests). Two of the proteins were present in all 10 volunteers. This suggests that protein expression in human skin might be affected by the exposure to RF-EMF. The number of affected proteins was similar to the number of affected proteins observed in our earlier in vitro studies. Artificial master gel for all sham and exposed skin samples of all 10 volunteers. Statistically significantly affected protein spots are marked in red color (declined expression) and in green color (increased expression). List of proteins that were present in at least 4 volunteers and which expression has been changed in statistically significant manner (<0.05) as determined by the variance analysis and the Wilcoxon test. Ratio = exposed sample expression/sham sample expression. Finally, our study confirms that the proposed by us proteomics approach  can identify protein targets of RF-EMF. This approach to EMF research has been subsequently accepted by the EMF scientists [12, 13] and has been included into the 2006 World Health Organization Research Agenda . However, new and larger study is urgently needed to strengthen our pilot observations and to determine what impact mobile phone exposure might have on human tissues. é Mobile phone radiation might alter protein expression in human skin. é Physiological significance of this change is not known and requires further study. é Larger human volunteer study will be needed to confirm results of this pilot study. 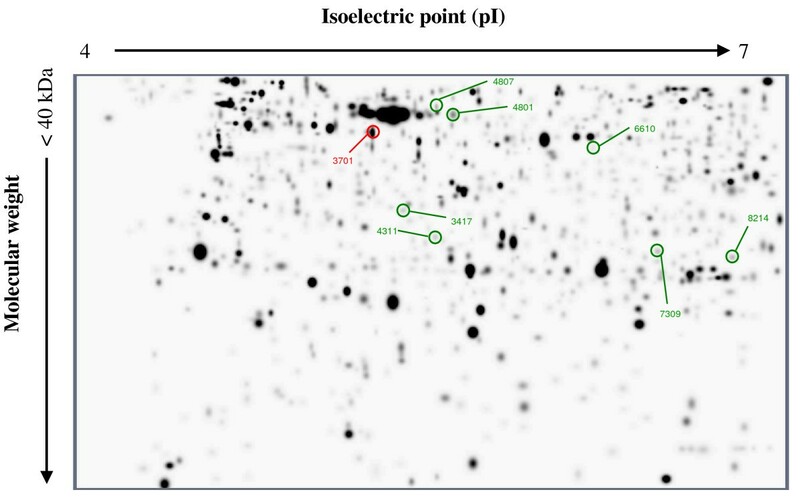 é Proteomics screening is valid method for search for molecular targets of mobile phone radiation. Without this approach the identification of the proteins responding to mobile phone radiation would not be reasonably possible.